Admit it. 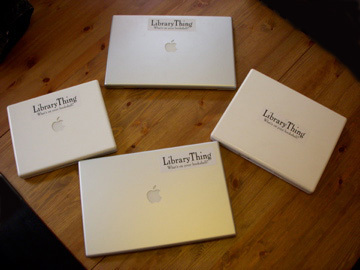 You’re sitting in a coffee shop with your computer and you wish everyone around you knew of your love for LibraryThing. We now have stickers for sale that you can use for anything—but they’re perfect for laptops. They’re made on a premium “pressable” stock, making them removable and repositionable. So you can stick it on your laptop, then decide to rearrange or take it away completely without leaving sticker mess. You can, of course, use them for non-laptop purposes as well. Warning: they’ve got a laminated front, but they’re paper-based—so they might not make a good bumper sticker. They’re for sale for only $2 each—and free First Class shipping in the US (you can upgrade to priority mail, or pay to have it shipped internationally).